Dave Lapham (right) interviews Zac Taylor at Tuesday's Town Hall. Zac Taylor doesn’t coach his first Bengals game at Paul Brown Stadium until August. 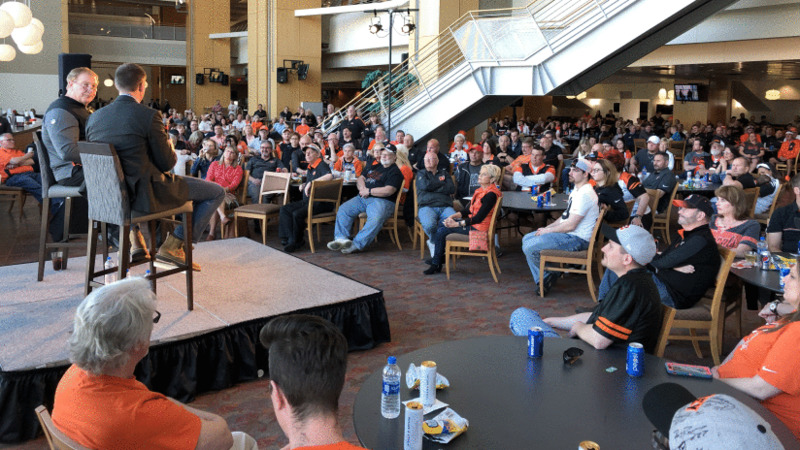 But he already had the faithful leaving the building a week before the draft pumped up Tuesday night after a question-and-answer session among season ticket holders and business partners gathered in a club lounge featuring a sun setting behind the downtown Cincinnati skyline as Taylor’s reign begins to rise. That will happen when you take questions for nearly an hour from some of the estimated crowd of 800 to 1,000. And then with your wife waiting, patiently holding an impromptu reception line for photos and autographs. When he signed the back of Mongo’s jersey, which appeared to be between the name “Mongo,” and the No. 54, Mongo asked him to “Take us to the promised land,” as several wished him well and told him they were glad he was here. “Thank you. I’m ready,” was always the polite answer from the fresh-faced 35-year-old head man, whose jeans and boots are becoming his standard attire. What’s also becoming standard is his steadiness. 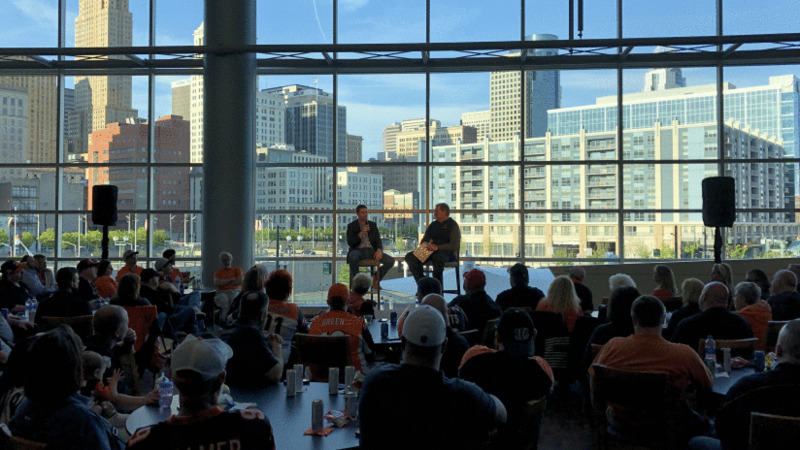 Long-time Bengals Radio Network analyst Dave Lapham, who MC’d the event, complimented him on the even keel that keeps surfacing whenever he appears publicly. Take the answers from his introductory news conference, his NFL scouting combine interviews and last month’s appearance at the coaches media breakfast during the annual NFL meeting in Phoenix and hardly a semicolon diverted on Tuesday night. For instance, he stayed true when Lapham asked him about running back Mark Walton’s release after three off-field incidents. Lapham told a terrific anecdote at the outset that went back to Taylor’s days as the Nebraska quarterback in 2005-6, when Lapham was doing TV for Big 12 games. He said that Taylor and Texas quarterback Major Applewhite were the two most impressive QBs talking the game. “This guy knew the offense as well or better than the coordinator, the head coach. Football acumen extradonaire,” Lapham said. Lapham introduced Taylor’s wife to the crowd and then turned around a question to her when someone asked her husband how many hours he’d work a day during the season. “No, you can’t work 30 in a day,” Taylor answered her. Taylor reiterated he felt it was an advantage being the last NFL head coach hired because he didn’t have to compete for assistant coaches. He also said the number of assistants he brought from the college game (ten of his 21 assistants were in college last season) has given them an advantage in the draft process because they know, coached or coached against many prospects. All of those 21 assistants, the most the Bengals have ever had, have their own office thanks to a massive renovation of the players and coaches spaces spurred by Taylor. That’s just one of the things Taylor points to when he talks about the support from above. He elaborated Tuesday when someone asked about the perception that ownership doesn’t give head coaches enough latitude to win. Mongo, is that Mongo in the article you? At least one thing has become abundantly clear. Zac Taylor makes a great first impression. Well deserved IMO. I can hardly wait until he starts working with the players rather than the media. I've read a few things that surprised me, in a good way. One player mentioned his "swagger" - I don't see him as a chest thumper, but he definitely exudes confidence. I also like his focus on communication and getting to know your teammates. Sam Wyche did that back in the day, and a number of guys said that made a big difference in playing for each other. I watched a feature on him when he was a lowly QB coach still deferring to a head coach. He does not lack for confidence but it didn't come off as arrogant...partly because he doesn't take credit for most of the things he coaches. He interacts with players from the perspective of someone young enough to still be playing if only he was more talented. Specifically, his rapport with Goff was incredible and I expect it to be as good or better with Dalton. Of note...Taylor even participated in the QB rotation on certain drills and talked smack when he beat a defender or made a great throw. They feature also noted how he's in constant motion. Seems to be everywhere but always helpful. Not sneaky. Talking the talk is one thing, of course. But there is still a lot of proving for Taylor to do, to management, to the players, to the fans. Part of that got started Tuesday after the team-wide address when Taylor, who will be calling plays, got to work in the first offensive meeting. And he threw a lot at them. “In one day we went over all the formations. One day!” Boyd said. “Usually we’ll break it up. But he simplifies it so well and makes it understandable. The way he teaches, it makes it easy for us to break it down and see how everything correlates. So that really struck me. For a guy who is so young, he’s so smart. That’s one thing I think guys really noticed about him. Not just his youth, but his intelligence. Just read a nice Dayton Daily News article about how Anarumo's simplified "clear cut" scheme may help defenders play faster. Same broad themes as Zac Taylor emphasizes on offense. Better communication stressed. Carlos Dunlap sounds like he's onboard. No surprise there but maybe a surprise he took a shot at Teryl Austin in the process. Didn't point an actual finger but he seemed to admit the players, mostly veterans, didn't know what they were doing last season. Ha! How weird! Not me. I got the email for that meet and greet, but couldn’t go... And for whatever reason, I’ve always had a thing about going all lower case on mongo. It just looks better to me. And for whatever reason, I’ve always had a thing about going all lower case on mongo. It just looks better to me.